For the ninth volume of FRKWYS, a music and film series pairing contemporary artists with those that may have preceded them in style and / or approach, Sun Araw and M. Geddes Gengras meet legendary dub reggae group The Congos in St. Catherine, Jamaica and create the full-length album,ICON GIVE THANK. In conjunction, RVNG will release ICON EYE, a feature film documenting the young musicians’ time spent living and learning The Congos way. In hindsight, the FRKWYS Vol. 9 timeline takes on dream-like qualities. In a matter of months, the idea for the collaboration was divinely inspired, The Congos reassembled in their original formation, and Sun Araw (earthly name Cameron Stallones), Gengras, alongside filmmakers Tony Lowe and Sam Fleischner, traveled to St. Catherine, Jamaica (45 minutes outside of Kingston) for ten days to undertake the unknown. What events would transpire in the Portmore neighborhood of St. Catherine can only be described as blessed. The gates opened wide and warmly, the musicians and filmmakers ate, slept, and smoked at The Congos headquarters, their mural-emblazoned studio, home, and spiritual compound. An environment steeped in the Ital lifestyle, Rastafarian reflection and meditation, and a rich community bubbling with musical energy, both young and old artist would learn an unspoken creative language. Having recorded some loose musical themes in LA to help inspire the creative process, Stallones and Gengras could only count on the shared respect for the sacrament of music to guide their work with The Congos. This respect is the foundation upon which Sun Araw & M. Geddes Gengras meet The Congos - ICON GIVE THANK is built. GIVE THANK is not a dub reggae album, though it shares some of the genre's production characteristics. Rather, it's an album of Stallones and Gengras's melodically experimental meditations ornamented with The Congos' soulful vocal leads and four-part harmonies. The four kings of the The Congos share the vocal throne over the course of GIVE THANK. "Congo Ashanti" Roy Johnson tenor, Cedric "Bongo" Myton's falsetto, Watty Burnett baritone, and Kenroy "Tallash" Fyffe cosmic vocal glue command singularity and create an essence combined. The visual companion to the musical fruit of GIVE THANK is ICON EYE, a feature-length travelogue executively produced by Christine Vachon (Killer Films) and Randall Poster & Gelya Robb (Search Party Music). Shot by Lowe and Fleischner, ICON EYE evokes a musical and cultural intersection through refracted atmospheres and a feeling of magical, rhythmic synchronicity. 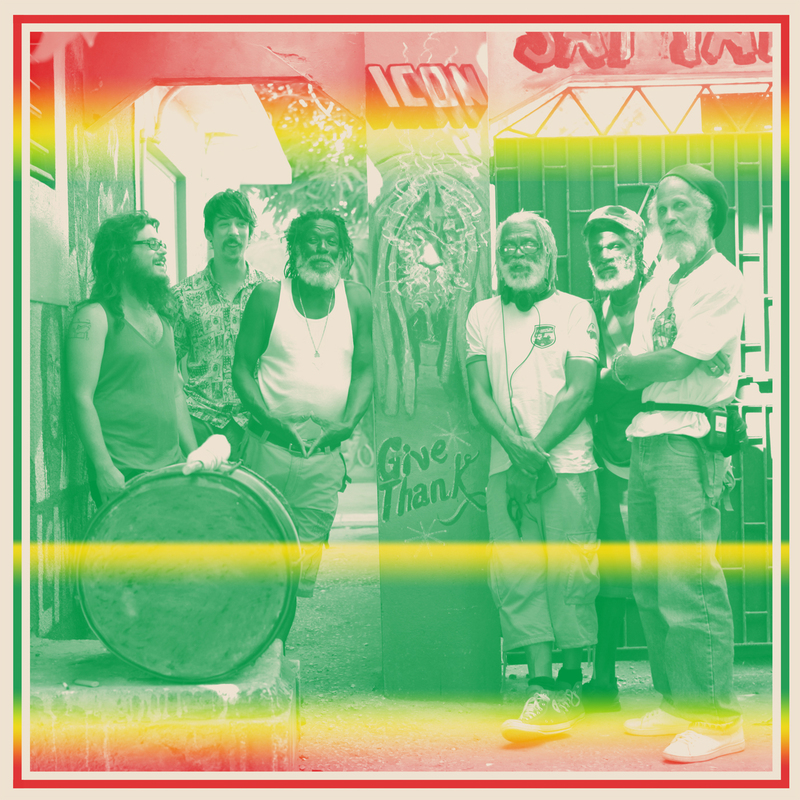 ICON EYE shares dubbed-out editing techniques inherent in the reggae sub-genre, rendering a visual "version" of the album. Through the diaristic yet cinematic lens of handheld HD cameras, secret moments from the studio, fishing villages, late night dances, abandoned hotels and The Congos' yard are blended into a strange tapestry. Musicians, computers, children, and food reveal mystical resonance. ICON EYE is the first RVNG Intl. film production. Director / editor / cinematographer Lowe and producer / cinematographer Fleischner previously collaborated on Below the Brain (2011), a documentary about Brooklyn Carnival.